YERUSHALAYIM – After months of campaigning, the results of Tuesday’s municipal elections are in – and in some cases, the election story is far from over. That’s the case in Yerushalayim, where the two top vote-getters in the four-way mayoral contest – Ofer Berkovich and Moshe Lion – will be participating in a runoff on November 13, as neither candidate got the 40 percent of the vote necessary to take the office in the first round. 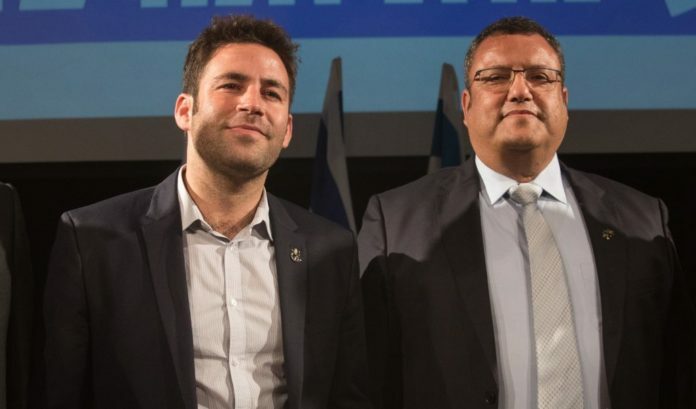 Lion, who has been active in city and national politics for many years, got one-third of all the votes cast in the city, while Berkowitz, who was running on a secular agenda, got 28.8 percent of all the votes.Out of the running are Yerushalayim Affairs Minister Ze’ev Elkin, and chareidi candidate Yossi Deitch. Both Lion and Berkowitz have appealed to supporters of their defeated opponents to support their campaigns. In the council elections, Degel HaTorah won six seats, Hitorerut – six, Shas – five, Agudas Yisrael – three, Yerushalayim Tatzliach – two, Meuchadim-King – two, Eitz-Bnei Torah – one, Pisgat Ze’ev – one, and Likud – one seat. Moshe Lion’s party didn’t pass the threshold. Besides Yerushalayim, second-round elections will take place in, among others, Rishon LeTzion, Kfar Sava, Gush Etzion, Hod Hasharon, Yehud, Meitar, Tzfas, Rosh Pina, Ramat Hasharon and Ra’anana. In Tel Aviv, Ron Huldai got 47.7 percent of all votes cast by city residents, enough for him to win his fifth term in office. With his win, Huldai becomes the longest-serving mayor in Tel Aviv’s history, eclipsing the four terms of Shlomo Lahat. Both of Huldai’s main competitors, entertainer Assaf Harel and deputy mayor Assaf Zamir, ran on a campaign that “young blood” was necessary to continue the city’s growth. Commenting on his victory, Huldai said that he was “back to work as usual on Wednesday. We have a great deal more to do.” In the council, Shas received three seats, while Ma’aminim (Agudas Yisrael-Yachad-Jewish Home) received one seat, and are missing just 17 votes for the second seat. The most dramatic contest in the country was occurring in strongly chareidi Beit Shemesh, where as of Wednesday morning, incumbent Moshe Abutbul was leading his chief competitor, Aliza Bloch, by just 251 votes. However, not all votes have been counted, among them the votes of IDF soldiers who are residents of the city. It is not clear how those votes will go. The results of the election, at least so far, came as a surprise to many residents, who expected Abutbul’s re-election to go smoothly. According to the Interior Ministry, Abutbul got 21,570 votes, while Bloch received 21,499. Uncounted so far are between 500 and 800 votes of soldiers and prisoners, and it is those votes that will apparently decide the election. As there are only two candidates, there is no need for a runoff. Another dramatic election took place in Haifa, where longtime mayor Yona Yahav was booted out of office. He was soundly defeated by new mayor Einat Kalish-Rotem, who got nearly 60 percent of the vote, compared to just 36 percent for Yahav. The main issues in that campaign related to the failure of the city to take off as a technology hub, eclipsed in that regard by Tel Aviv, and the ongoing pollution from the city’s many industrial plants. Degel HaTorah received two seats, with Agudas Yisrael and Shas one each. In Bnei Brak, Avraham Rubinstein won, as expected. In the city council, UTJ received 16 seats, Shas – six, Eitz-Bnei Torah – three, Yachad- one, and the Likud surprised with one seat. In Beitar, Meir Rubinstein won a third term. In the city council, Agudas Yisrael received six seats, Degel HaTorah – four, Shas – four, Anashim-Hershkop – one, and Toshavim – one. In Modi’in Ilit, Yaakov Gutterman won another term, with over 88 percent of the votes. UTJ received 13 seats, Shas – two and Eitz-Bnei Torah also received two seats. In Ashdod, Mayor Dr. Yechiel Lasri won another term, with 41.59 percent – just enough to win the first round. In the council seats, Ashdod Beyachad won six seats, Shas – five, UTJ – four, Ashdod Tenatzeiach – three, Atid Ashdod – two, Ashdod Betnufah – two, Commando Ashdod – one and Derech Chadashah also received one seat. In Elad, Mayor Yisrael Porush won another term, with 56 percent of the vote. In the council seats, Shas won five seats, Agudas Yisrael – four, Degel HaTorah – three, Avi Dayan – one, Jewish Home – one and Barak Tzabari also received one seat. In Petach Tikva, Mayor Itzik Braverman was defeated by Rami Greenberg. In Arad, in a battle between the chareidi and chiloni constituents, the incumbent mayor Nissan Ben Chamu defeated Moshe Edri, who was supported by the chareidi community and the Likud, by a large margin. An upset was seen in Tzfas as current mayor Ilan Shochat was defeated. In the second round of voting, the candidates will be Shuki Ohana who will face off against Nachman Gelbach.